OMG! I didn’t know Disney knew chocolate! Most of the time, when you have Disney chocolate it’s good…but not great. Hot chocolate from one of the quick service restaurants are okay. I love the chocolate covered gingerbread but that’s more about the gingerbread than the chocolate. Even the fudge from Candy Palace is only serviceable. 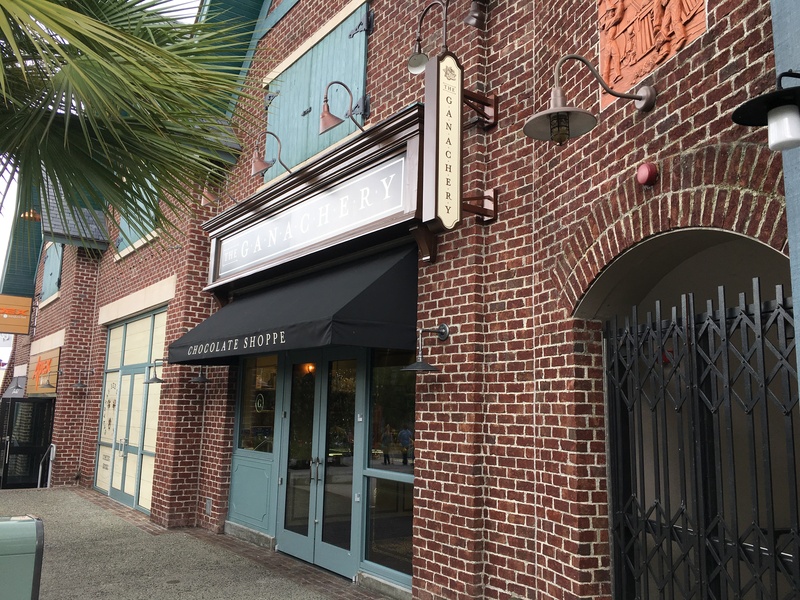 So when I walked into The Ganachery at Disney Springs in Walt Disney World, I assumed it was owned and operated by some gourmet chocolate company. Or it looked good but only tasted okay. Wrong on both counts. Specialty: Chocolate – what else? Craig’s Favorite: All of it great, but I have to go with the S’mores! The Ganachery is actually operated by Disney, staffed with Disney cast members who also make all the chocolate (and S’mores but more on that later). The chocolate is honestly some of the best I’ve ever tasted and I’ve had chocolate literally from around the world. This is so good, it’ll make you want to go back just for those heavenly bites of cocoa. They have a wide variety available in the main display case as well as pre-made bars and other little goodies scattered around the shop. But the most delectable treats are those chocolate squares in the case. At $3 a piece, they are so worth it. You can buy more for less all the way up to 12 pieces for only $27 which is like getting three pieces free. All of the ones I chose were simply delicious. We tried the Caramel Fleur de Sel, Key Lime, Dark 65%, and Egyptian Sea Salt. Each had distinct highlights but my favorite was the Egyptian Sea Salt. SO good. That contrast of salty and sweet really captured me like no other. I’ve had other salted chocolate, but not with that flavor profile or balance. The Key Lime was good, and it was seasonal. They don’t make it all the time so look around and ask when you’re there which flavors are being made that day. The highlight for me was the homemade S’mores. And when I say homemade, I mean it. Everything from the chocolate to the marshmallow to the graham crackers are homemade. And it is so good! Just beyond belief. After coating each cracker with a layer of melted chocolate, they then toast the homemade marshmallow with a hand torch until it’s nice and golden. 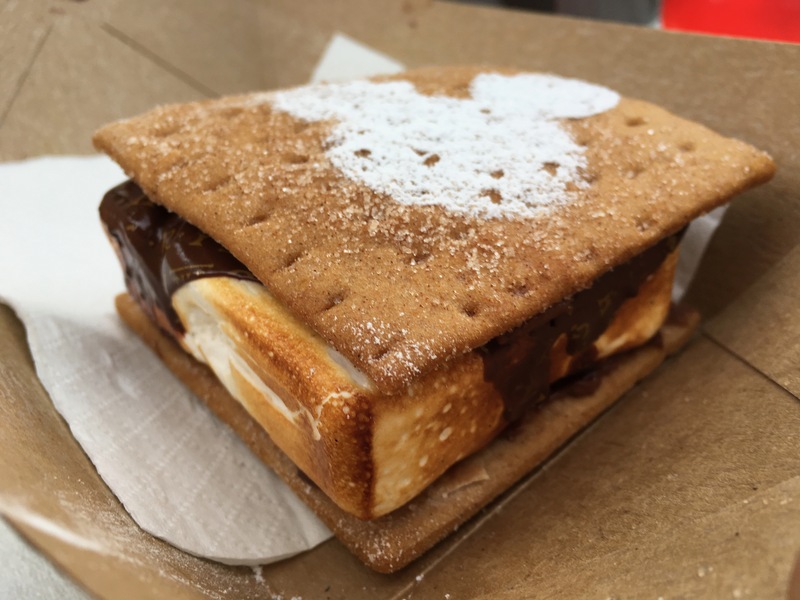 They place the marshmallow on top of a cracker and then add ANOTHER layer of chocolate which they melt directly on the marshmallow and then top it off with the other homemade graham cracker. To finish it, they dust it with powdered sugar in the shape of none other than Mickey Mouse. And for that one extra layer of guest service, the chocolatier brings it out to you. So fun! At only $8 this is beyond worth it. Get two. And then take home some of the delicious chocolates. Which by the way, they wrap up beautifully in a magnetically sealing box, wrapped with a Ganachery tag, placed inside a gift bag, and topped with tissue. Seriously above and beyond even Disney guest service standards. This is the place to go when you’re at Disney Springs! Previous Previous post: What Am I Going to Buy at D23 Expo 2017?